A French court has ordered Chanel to pay €200,000 for copying the crochet patterns of a former knitwear supplier. The supplier, World Tricot, claimed Chanel counterfeited its white knitwear pattern in 2009 when it sought £2.3m ($3.7m) in damages. World Tricot was ordered to pay Chanel damages when a court ruled against it but the decision has now been overturned. Payment to World Tricot falls well short of the £2.3m it sought three years ago but offsets the fine it faced for "public disparagement" of Chanel. The French fashion giant is now deciding whether to continue the case by appealing against the latest ruling. Being hit with a fine is something of a role-reversal for Chanel which is more used to protecting its own intellectual property. 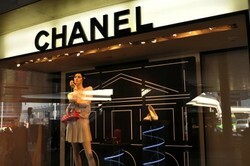 Last year a US judge allowed Chanel to seize the domains of 700 websites it accused of selling counterfeit products. Chanel is now forced to defend its own reputation. "This is the first time we have faced this type of situation. This very specific case is in no way a reflection of the quality of our relations with our suppliers," Bruno Pavlovsky, president of Chanel fashion, told WWD.